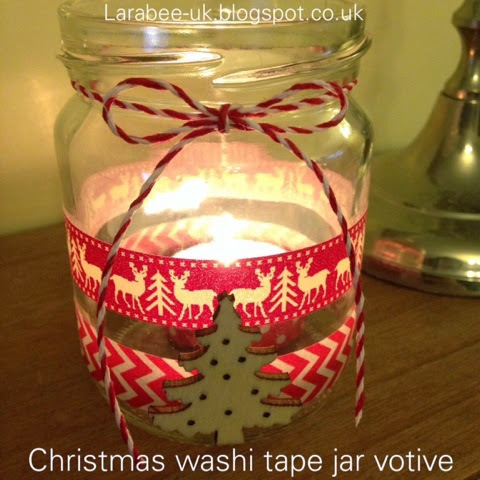 I know, I know, another jam jar candle holder thingy, I do like to re-use old jam jars and make them into cute little candle 'votives'. This is another super simple one using some christmas washi, a little bit of bakers twine and a wooden christmas tree (optional). Perfect for Tweens or teens to make for grandparents or teachers! If you like this, you may like my photo candle votive and my glow in the dark dotty votive. Make a few now for secret santa gifts or unexpected visitors. Thanks so much, it is such a busy time isn't it? That's why I always keep it simple. Thanks for commenting. Such a simple yet effective idea! I really need to get myself some of this washi tape. I have heard (and seen) great things done with it but have yet to try it myself! Ouuu I love washi tape! It's crazy that it's nearly Christmas! Thanks Cheryl yes there are some really beautiful ones available! Very simple, but effective! I love washing tape and need ideas to use my collection! I will definitely be making some cute jar votives.